A conventional protective kit allows only a maximum of an hour’s stay in an infested area. Troops combating chemical warfare will get a unique suit which will allow specialists to work up to ten hours in a cloud of chlorine gas or ammonia. 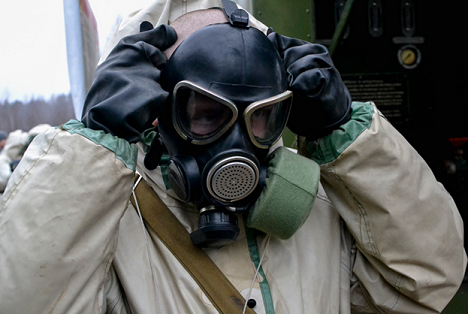 The Russian Chemical Corps and military regiments of the Ministry of Emergency Situations (formed to eliminate the consequences of natural disasters and man-made disasters in facilities inside the Defence Ministry) are set to get unique equipment, which will give them almost total protection against the effects of chemical warfare agents, radioactive dust and bacteriological weapons. The new suit, designed by the Kazan Chemical Research Institute, allows specialists to spend hours in zones of weapons of mass destruction or man-made disasters, as well as to work safely with highly toxic materials. The product, designed and built by developers in Kazan, is a gas-tight “jumpsuit” with sealed zippers, made from materials that are resistant to aggressive agents and flames. The suit will have a device to allow users to breathe, hidden inside a protected armoured box. “At the moment, this suit is undergoing factory testing, which should be completed before the end of this year,” Rustem Khayapov, official representative of the Kazan Chemical Research Institute, told Izvestia. “The finished product will be presented in 2017. A specialist, dressed in this new ultra-secure package, will be able to work up to ten hours in a cloud of chlorine gas or ammonia, and endure, for up to eight hours, the impact of concentrated sulfuric acid, hydrochloric acid or hydrofluoric acid. The suit also allows for up to three hours of work with heptyl and amyl. A conventional protective kit allows only a maximum of an hour’s stay in an infested area. Also, the standard model does not guarantee 100-percent protection against highly toxic compounds such as heptyl and amyl, or widely used propellants, which instantly corrode rubber and belong to the first hazard class. The Kazan Institute’s new creation is intended for repeated use: after decontamination (removing the toxic substances from protective clothing with water or chemicals) the protective suit can be used again. The suit will be used along with a special breathing apparatus under high pressure, which will provide the air supply. For example, terrorists from extremist groups in the recent storming of one of the districts of Aleppo used homemade missiles against government troops, equipped with chlorine and white phosphorus. Karyakin said a suit with this level protection is not so much needed by the Russian Chemical Corps, as by the military regiments of the Ministry of Emergency Situations, which will soon be deployed in each of the country’s military districts. “To date, mobile robots which can fully replace humans to eliminate consequences of technological disasters have not been built, and all operations continue to fall on the shoulders of people,” said Karyakin. “Particularly indicative of this fact is the accident at the Japanese Fukushima-1 nuclear power plant, where it was seen that protection of the rescuers remained at the same level as that of the liquidators of the Chernobyl disaster.